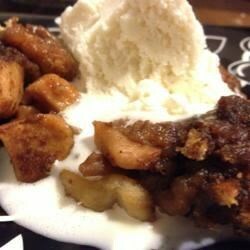 "Apples, spices and bread cubes come together in this quick dessert that you can make in the slow cooker." Place apples into the crock of a slow cooker. In a medium bowl, toss together the bread cubes, cinnamon, nutmeg, salt and brown sugar. Place on top of the apples and drizzle with melted butter. Cover and cook on Low for 3 hours, or until apples are tender. Simple, easy to prepare and tasty. I added some oats and served it with custard. This is by no means a fancy dessert set to impress but for a simple midweek or family dessert this is ideal.